... to look a lot like Christmas at the Carmack house!! That's a picture of Sam when he was little ... and that's the little Christmas sock he's holding in the picture. 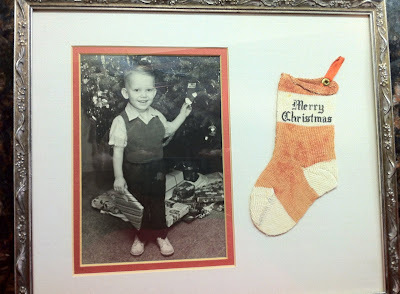 (A few years ago his sister, Pat, had that framed - with the sock.) I love it!! 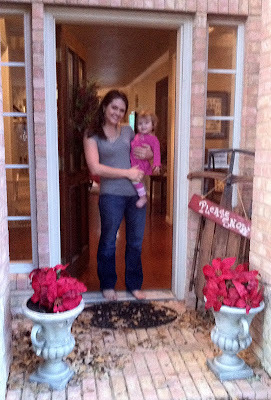 That's Elizabeth holding Anna, at their front door. Notice the sled to Elizabeth and Anna's left (your right). We really need to take another picture, since Ryan and Bailey and little Anna have joined the family! Now I have to show you another picture that I ABSOLUTELY love. Elizabeth sent me this in a text around Thanksgiving week. It was colored and dictated by little Andrew, my three-year-old great nephew. If you study it, you will see why I LOVE IT SO MUCH!!!! Well, you can see how that would make me feel WONDERFUL!!! As I type this there are 15 hours left on my recent poll (upper right). If you haven't voted, please do. oh, that picture of Sam is adorable!!!!! Too cute!! That picture from Andrew is the best. And I LOVE the sock with little Sam. How great to preserve those memories! That photo of Sam as a child is the most precious thing ever. 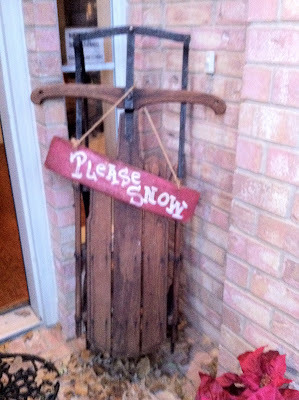 Gives me an idea of what to do with a three of MY treasures! I'm so behind on my blogging - it's been a busy month. Hopefully I can catch up on this rainy Saturday. I think the new poll you put up this morning is the best one you've ever come up with - REALLY!!! It looks like most of your readers agree with my choice too - usually I'm way off from the crowd. All the pictures are wonderful and I love the header pics! You put me in the Christmas spirit...I've been dragging my feet this year. Thanks for all that you share with us!